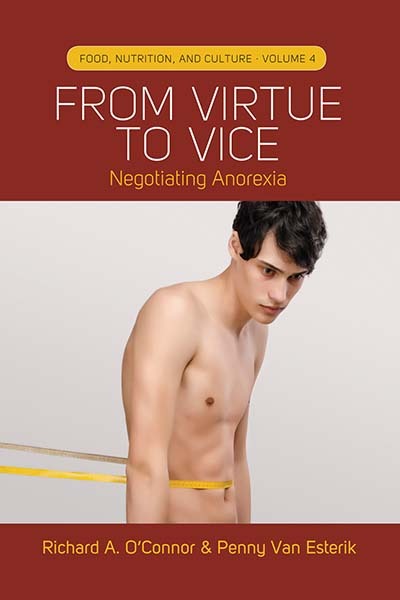 From Virtue to Vice: Negotiating Anorexia is the result of creative and academic collaboration between Penny Van Esterik and Richard A. O’Connor. In the following post, Van Esterik reflects on the collaboration of this pair—Van Esterik, an expert on breastfeeding, and O’Connor, an anthropologist who watched someone close suffer with anorexia—and how their book was made much stronger through their unique vantage points. Like most academics, I am a lone wolf writer, needing the silence to propel my thoughts on to screens and paper. But sometimes we become more than the sum of our isolated parts when we work together. Richard’s voice as an anthropologist was already in my work long before we began formal collaboration on From Virtue to Vice and ongoing in The Dance of Nurture [their next co-written book on breastfeeding]. We are both ardent fans of our own versions of anthropology. Rich demands more theoretical depth, while I seek simplicity and clarity to draw more people into the conversation, a habit acquired from advocacy writing that must be translated into multiple languages. Our academic styles complement each other, but not always our working styles. He writes on an empty stomach at 4 am and snoozes by noon. I eat a hearty breakfast and start thinking around 9 am. Over the years, we invaded each other’s family vacations in Cape Cod and Muskoka to review draft chapters and brainstorm next steps. (I am seeking photographic evidence of this.) Our families easily expanded to absorb co-authors, and we thank them for that. But neither of us had a model for working together as co-authors on subjects as diverse as eating disorders and breastfeeding. At best, we finished each other’s thoughts; at worst, he thought about anorexia and I thought about breastfeeding, seemingly disparate topics that we hope to analyze as parallel cases. Were we collaborators? In my thesaurus, a collaborator refers to a traitor, turncoat or spy; a second entry refers to a co-worker, colleague, partner or teammate. The second iteration comes closer to my relation with Rich. Perhaps we are seconds to each other. In the OED, a second is a unit of time, next in rank, or one who represents the principal in a duel by carrying the challenge, arranging locality and loading weapons. Although our arguments have been challenged, I have not had to load any weapons yet! But a second is also one who supports, backs up and encourages another, one who rises in support of, or backs another’s opinion. We are that to each other, in spades. But we are strange seconds to each other. I am eating disorders once removed; he is breastfeeding once removed. He has no bodily experience of breastfeeding but finds it useful to think with, for it is the prototype of commensality and nurture, in many ways the inverse of eating disorders. His personal commitment to nurture as a way of life is expressed through fathering and teaching. While we both have daughters, mine has never had any sign of eating disorders, although she has been in contexts where everyone has pressured her to lose weight, specifically during dance training in a competitive high school of performing arts. But before we began working together, eating disorders made no sense to me as a mother or as an anthropologist. My involvement with food has been primarily therapeutic and intellectual, having taught nutritional anthropology for many years. I could afford to lose a few pounds, but have never seriously dieted until one year I joined my husband on the high protein Atkin’s diet. I was thrilled to see the pounds roll off. Gradually we bored of life without rice, pasta, potatoes and bread and went back to ‘normal eating’. To my horror, the weight came back in the one place I really didn’t need it – my breasts! For the first time in my life, I understood how anorexics could talk of wanting to cut off their breasts. However, when I was diagnosed with breast cancer in 2010, cutting off a breast became a potential treatment option, and once again the complexity of our subject matters deepened. We also share another powerful experience; we both conducted our first ethnographic fieldwork in Thailand, and we both continue to use Thailand to educate ourselves about other times and places. We are thus able to collaborate and act as seconds to each other in these two projects. I am thrilled to see how Berghahn has helped us bring the result of our first collaboration to publication, and after some celebratory moments, we will settle down to collaborate on our second. Read Richard A. O’Connor’s post on our blog here. Penny Van Esterik is a retired Professor of Anthropology from York University where she taught nutritional anthropology, advocacy anthropology and feminist theory. Past books include Beyond the Breast-Bottle Controversy, Materializing Thailand, and Food and Culture: A Reader (edited with Carole Counihan).